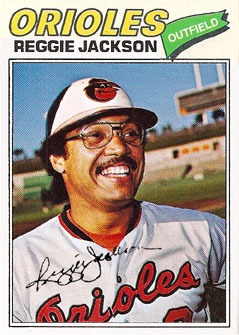 I created the two cards below in Photoshop for an article I wrote for SB Nation on Reggie Jackson’s 1976 season with the Orioles. 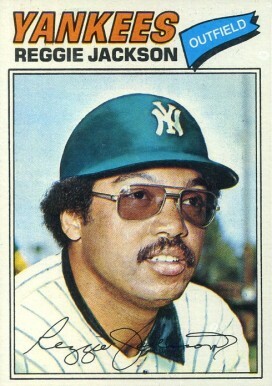 Jackson’s lone season in Baltimore always seemed like one lost to history to me, in part because he signed with the Yankees that November, in plenty of time for Topps to airbrush a Yankee uniform on Jackson for his regular-issue 1977 card (worse yet, the base photo is from his days with the A’s per the green-and-gold sleeve of a teammate over his right shoulder). 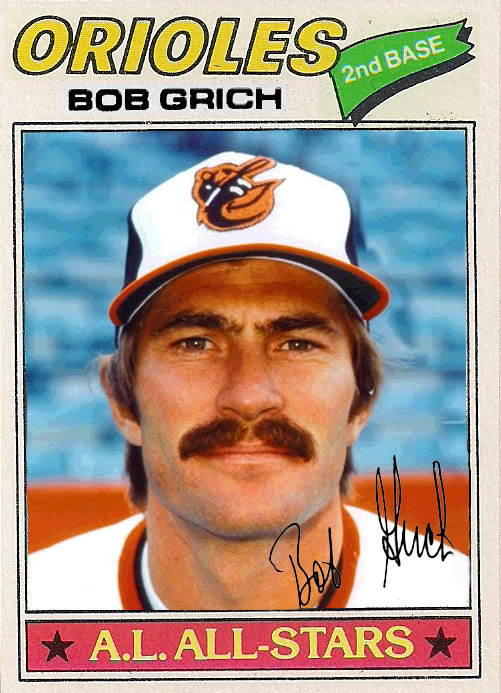 While I was at it, I couldn’t resist giving Bobby Grich a 1977 Orioles card was well. Grich and Jackson were the Orioles’ two best hitters in 1976, but both signed with other clubs as free agents in November. 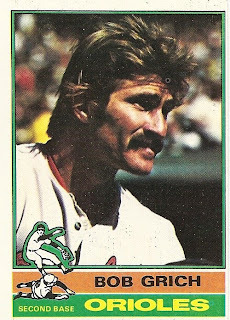 Grich’s actual 1977 Topps card shows him on the Angels (without a cap, but with an airbrushed collar). Because Grich was capless on his 1976 card as well, he never appeared on a Topps card in the white-front cap the Orioles wore in his final two seasons in Baltimore. The Jackson card is built from a rare proof of Jackson in an Orioles uniform on a Yankees template and Al Bumbry’s actual 1977 Orioles card. Keith Olbermann owns one of eight of the Jackson proofs known to be in circulation and the card below is built from the scan of that card he posted to his MLB.com blog two years ago. The Grich card is built from a variety of actual 1977 cards (including Grich’s, Bumbry’s, and Rennie Stennett’s) and photo found on ebay (which was also the source of the two autographs).